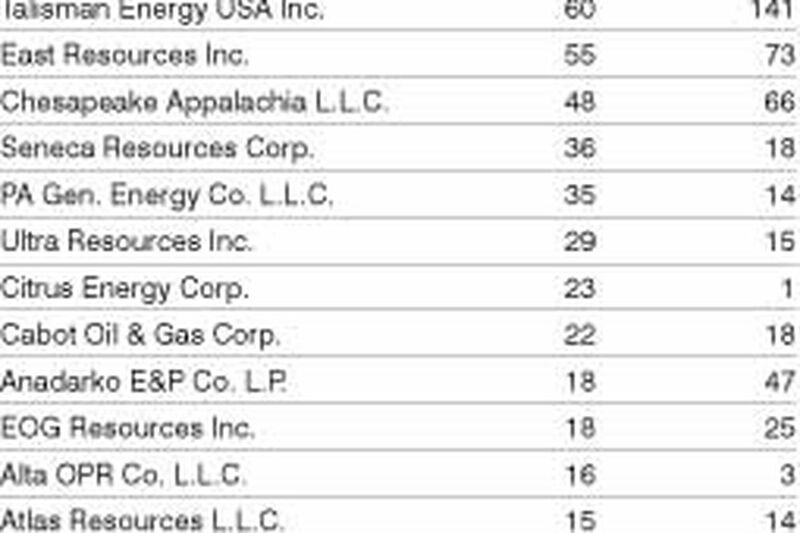 Pennsylvania environmental regulators have issued nearly 565 citations against Marcellus Shale natural gas operators so far this year - about twice last year's pace. Five companies were responsible for half the violations, and nearly three-quarters of them occurred in five north-central Pennsylvania counties where shale-gas drilling is most intensely concentrated, according to a report by the Department of Environmental Protection sent Wednesday to the state Senate's Environmental Resources and Energy Committee. DEP Secretary John Hanger, who provided the numbers to the Senate committee, said in an interview that the growing volume of violations did not indicate a deterioration in safe practices, but rather reflected a dramatic increase in Marcellus drilling activity, along with an increase in regulatory oversight. "What it demonstrates is how active our inspection program is," Hanger said. DEP's Oil and Gas Bureau, which came under fire as being unprepared for the gas-drilling boom, has nearly doubled its staff over two years, to 196. Its budget is funded by drilling fees and fines, and it is unaffected by cuts to DEP's budget, Hanger said. "We are in the process of growing this regulatory oversight because this industry needs it, the public rightly demands it, and the way to a truly world-class industry is to have checks and balances," he said. As of June 18, the department had conducted 1,866 inspections this year of 636 Marcellus wells. For all of 2009, about 2,000 Marcellus inspections were conducted. Since drilling began in 2005, the state has issued 3,773 Marcellus well permits; 1,458 wells have been drilled. Several drilling accidents have attracted substantial attention: the June 3 blowout of an EOG Resources well in Clearfield County, and a series of incidents last year that prompted DEP to suspend Cabot Oil & Gas Corp. operations in Dimock Township, Susquehanna County. But Hanger characterized most of the citations as being for administrative violations that are quickly remedied, "the equivalent to a letter home to the parents." The Marcellus Shale lies under about two-thirds of the state. Drilling, initially concentrated in southwestern Pennsylvania, has migrated steadily to the northeast. Though inspectors visited Marcellus well sites in 29 counties, five counties accounted for 413 of the 565 violations: Bradford, Tioga, Lycoming, Susquehanna, and Potter, all in north-central Pennsylvania. Five of 37 operators accounted for half the violations: Chief Oil & Gas L.L.C., Talisman Energy USA Inc., East Resources Inc., Chesapeake Energy Corp., and Seneca Resources Corp.
Chief Oil & Gas, which experienced a serious well explosion in West Virginia in June that injured seven workers, topped the list, with 78 violations this year. Kristi Gittins, a spokeswoman for Chief, based in Dallas, said the DEP's tally did not distinguish between serious or administrative violations, like not having proper paperwork on a well site. "Chief has and will continue to work with the DEP and the Marcellus Shale Coalition operators to implement best practices so that violations, administrative or otherwise, are reduced," Gittins said in an e-mail response. Hanger said it was also worth noting that some operators had relatively low ratios of violations to wells drilled. While Chief racked up 78 violations at 22 well sites - a ratio of 3.5 violations per well - Range Resources, the most active Marcellus operator, had 12 violations on 77 wells drilled this year, an average of 0.16 violations per well. "That's obviously the way we want to go," Hanger said. Patrick Henderson, a spokesman for State Sen. Mary Jo White (R., Venango), chairwoman of the environment and energy committee that requested the report, said it was imperative to reduce the violations. "These numbers are but a snapshot in time," Henderson said. "They are important and helpful, and provide a baseline to evaluate progress on environmental, safety, and administrative compliance in the future."